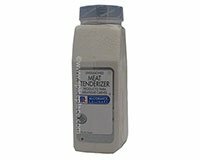 Unseasoned Meat Tenderizer has no flavor and is a blend of salt, dextrose, bromelain (tenderizer derived from pineapple), and calcium silicate (added to make free flowing). McCormick Meat Tenderizers contain bromelain, an enzyme that breaks down tissue. The enzyme action stops only when heated so tenderizers must always be used prior to cooking. If tenderizer is left on meat too long before cooking, meats will become mushy. Freezing will not completely stop the enzyme action. McCormick Meat Tenderizers are used for less tender cuts of meat. Just before cooking, moisten surface of meat with water; sprinkle evenly with McCormick Unseasoned Meat Tenderizer using 1 teaspoon per pound of meat. Pierce the surface of the meat with the tines of a fork for better penetration into the meat. For thicker cuts of meat, sprinkle with tenderizer and let stand 30 minutes before cooking. Another use for Unseasoned Meat Tenderizer is to relieve the pain caused by bees, wasps, jellyfish, and coral. Mix the McCormick Meat Tenderizer with water and put the paste on the painful spot. Ingredients: Salt, Dextrose, Bromelain and Calcium Silicate (Added To Make Free Flowing.